Boost your open water swim, bike, run skills in clinics offered by us - the San Francisco Bay open water swim experts and Ironman® champion coaches! 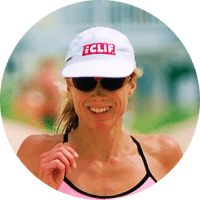 All triathlon clinics feature three options to register: swim only, run & bike only, or full clinic, so whether you just want to practice for an Alcatraz swim or prep the three legs for your upcoming Ironman® or other triathlon, join us. Great for Escape From Alcatraz Triathlon! Practice all three legs plus transitions, or mix and match legs. Swim only available, too! An evening clinic to help swimmers practice the last leg towards the finish line. A morning clinic that will have you hop in and hop out at notable patches near Alcatraz and in the bay. An opportunity to swim the whole course, or hop in hop out like the clinic! Fun. Extremely informative. A huge confidence booster. Great coaches and boat captain, and kayakers. Did I mention how much fun it was? Very organized and experienced. Demystifies the swim. Excellent tips. Good camaraderie -- all those Escape triathletes were stoked, many repeat customers of WWS, and truly seemed appreciative about the edge it gives them. This is my 2nd year doing this and the crew helped me to improve my sighting, swim technique (specifically breathing in the cold water) and outlook on getting across the Bay with comfort and style! We have a series of Alcatraz swim clinics scheduled year round. Do not miss the opportunity to learn about the crossing before your event! Many swimmers who have trained with us during our clinics have reported better times in their competitions and feeling strong and confident during their race. Our Crissy Field/St. Francis clinics include a mile of open water swimming and instruction and advice from coaches. During our bay/Alcatraz clinics, swimmers are transported to Alcatraz by boat and try the water in 2-3 notable places for 10-15 minutes at a time under the guidance of our coaches. This is very valuable experience so that on race day you don't encounter an unwelcome surprise - you are ready! Upon request, our WWS coaches will critique your stroke and provide you with suggestions to make your stroke more efficient and faster. This is a wonderful experience with a great group of people in a non-competitive environment. This length is much like the last swim leg of many big bay events, and you'll experience some of the currents and water you'll find out at Alcatraz. During a bay/Alcatraz clinic, swimmers are transported to Alcatraz by boat. Once we arrive at Alcatraz, participants swim near the island to experience sighting and the currents of the bay. After the swimmers return to the boat, they are taken to the potato patch to experience the rough water in front of Alcatraz, as well as some other notable locations. The last jump is near the race finish line and swimmers practice sighting, and “feel” the water near the cove opening to Aquatic Park, St. Francis, or Crissy Field. You will learn about currents expected during your race and strategy. RACING THE ESCAPE FROM ALCATRAZ TRIATHLON OR OTHER BAY TRI? Check out our conveniently timed Alcatraz swim clinics to help boost your open water swim. Literally 100% of surveyed triathletes who did a clinic with us would recommend them (no joke)! Pick from offshore clinics, to hop-in-hop-out Alcatraz clinics, to full test swims. You'll be fully briefed on what to expect, best strategies, and tips for race day success. DISCOUNT PRICING FOR ESCAPE TRIATHLETES AVAILABLE AT ONLINE REGISTRATION! 2019 REGISTRATION OPEN! Starting triathlon for the first time? Seasoned triathlete? Adding Alcatraz to your list of bucket list swims, or want to improve your Alcatraz PR? Whether you are new to the sport of triathlon, have a few races under your belt, or several seasons, Water World Swim Triathlon Clinics can help you achieve the next level in your endurance training. Hone your transition skills. Fine-tune your open water swimming, sighting, stroke technique. Adjust your bike posture, improve your cadence, discuss bike fit, and gear. Learn how to save your legs for the run. Achieve more running technique. Gain the advantage and spend your day with the experienced triathlon coaches at Water World Swim and cross the finish line well-prepared. We'll have a Q&A with our coaches after a nutritious lunch to round out the morning! Make Water World Swim a part of your triathlon training plan. Water World Swim has over 20 years of experience training swimmers of all levels, elite triathletes and age groupers swim from Alcatraz to the Finish Line efficiently, effectively and safely. Water World Swim’s Triathlon Coaches have extensive experience (and podium finishes) at Escape from Alcatraz™ Triathlon, Ironman® World Championship, Ironman® 70.3, Ultraman, Death Ride, and Boston Marathon to name a few events. Bring the equipment you would use race day - your race day wetsuit, tuned bicycle, approved helmet, and well-fitting running shoes. This is a learning experience, but bring capable tools. Be prepared to cover the distances. This is not a clinic that readies you in one session - this is to tailor your training in the right direction. You should at least be training for general fitness. Kathy says, “Set your mind to something and the possibilities are endless. Don’t let anyone tell you that you are not capable, find out for yourself what you are made of, the results may surprise you. Embrace each day, see what the day gives you and make the most of it."